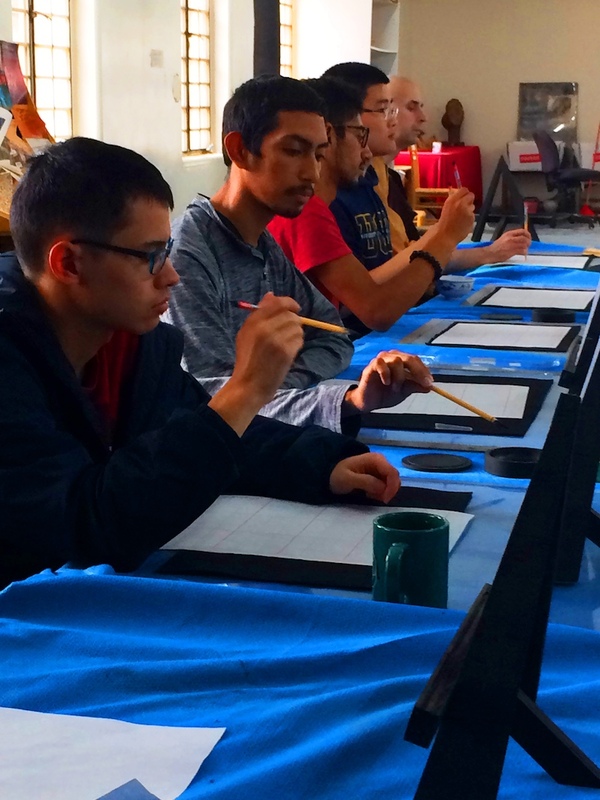 This calligraphy lab for Classical Chinese I occurred on October 4, 2018. In Classical Chinese I, my classmates and I were introduced to the four treasures of the ancient Chinese scholar’s room: brush, ink, paper, and ink stone. To experience the art and technique of Chinese calligraphy writing, my classmates and I headed to the Calligraphy Room located in the K-12 school building adjacent to the University Building. While walking there, some of my classmates practiced our vowel combinations for our Chinese pinyin (a form of Chinese romanization) quiz that we had later that day in class, audibly drawing out the combinations of “ao” and “ou” as we walked. I found myself fairly amused, for “ao” sounds like “ow” and “ou” sounds like “oh,” making our quiz practice sound quite jarring to anyone listening to our class. Our calligraphy teacher for the day, Mr. Li, entered the room after we finished setting up the materials. We all welcomed him with a loud “你好,李老師！” (Hello, Mr. Li!). To begin, Mr. Li taught us how to “開筆” (literally “open the brush/pen”) with our new calligraphy brushes. Mr. Li demonstrated this by massaging the brush hairs of the new brush in warm water. Mr. Li pinned a piece of practice calligraphy paper on the bulletin board and demonstrated one of the fundamental strokes: the straight horizontal line. He demonstrated seven subtle components of brush movement that went into comprising one straight horizontal line. His years of experience made the execution of the stroke seem so simple, yet my classmates and I saw the stroke’s immense intricacy. After showing us two more horizontal lines, he told us to try our own. We prepared our brushes with ink and positioned ourselves over our paper, with reference sheets placed on the easels in front of us. While we were practicing the stroke, Mr. Li walked behind everyone’s chair answering questions and correcting posture and technique. Just by doing this, he could see certain qualities of each person exuded through how they wrote. One of my classmates had not touched his brush to the paper yet and asked for more clarification on how to write the stroke. Mr. Li told him: “Well, you seem quite cautious. You need to write at least one line for me to tell you what to work on.” My classmates and I sat there wide-eyed, surprised at how telling calligraphy was at revealing the qualities of a person. Another classmate was told that she was too tense, and that she needed to relax, both in the writing posture and in general. I kept practicing my horizontal strokes, sensing Mr. Li’s gaze on my work. I looked at my imperfect horizontal strokes, noticing that the ink had bled from not being completely retained by the practice paper. Feeling increasingly nervous, I awaited what he had to say. To my surprise he said, “This is actually very good. I can tell that you’ve done this before.” His keen eye picked up that I had prior experience with calligraphy. From this, I learned that it is not the precise and neat appearance of a stroke that validates it as proper. Even an imperfect line could be identified as proper if the technique was correct. This presented me with a valuable lesson: there is more to true sincerity and practice than how someone or something appears. Until this calligraphy lesson, I had never realized how much my perspectives, hesitations, and attitudes shaped my thoughts and actions. Mr. Li acted as a “Good and Wise Advisor,” as mentioned in the Sixth Patriarch's Dharma Jewel Platform Sutra, the main Buddhist text my classmates and I are reading this semester. In this book, a “Good and Wise Advisor” is someone who is able to identify the areas that the advised needs to work on. From the lesson the Good and Wise Advisor teaches, the advised learns to improve, whether it be through implementing a necessary shift in perspective or recognizing the implications of certain thoughts and actions. Mr. Li corrected and encouraged us in our learning process so that we would be motivated to keep going, while teaching us the proper way to write. He had the developed his keen eye through his countless years of practice, using his experience to help us adjust our technique. A Good and Wise Advisor in cultivation is someone who does the same: someone who brings people back to always thinking, doing, and embodying what is right. Through this, I realized that cultivation and calligraphy are strikingly similar.